Old school, meet new school. On-field celebrations in baseball have become commonplace, mostly in the form of home plate scrums around a guy who has just scored the winning run. It’s gone from unheard of to accepted with the span of just a few years, and, Kendrys Morales aside, nobody has much of a problem with it. The primary factor in this recent acceptance is that it’s celebration of a victory. (Such a display mid-game would be taken very differently.) It’s also why the one position that can get away with comparable shenanigans is a closer, following the final out of a win. Think Dennis Eckersley’s six-shooters, or Brian Wilson’s crossed-arm salute. 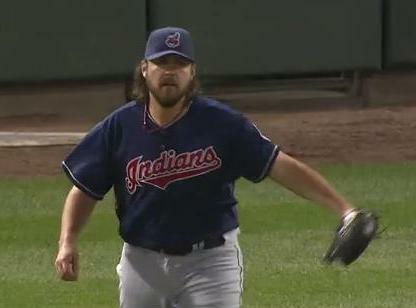 In that regard, Cleveland closer Chris Perez isn’t so unique, freely exuberating on the mound following a job well done. Well, he did his job on Thursday, and Alex Rios didn’t appreciate it. Perhaps it was because Rios had just made the final out of the game, grounding to shortstop Asdrubal Cabrera to close Cleveland’s 7-5 victory over the White Sox. Perhaps it was because Perez was not just gesticulating, but yelling in celebration. Maybe it was because the pitcher had also snuck in a self-congratulatory fist pump after striking out A.J. Pierzynski a batter earlier. Because Perez does this kind of thing frequently, it’s unlikely that his comments were directed toward Rios or the White Sox. According to Rios, that hardly matters. “If he was celebrating, that was not the right way to do it,” he said. Which is what makes this juncture in baseball history so interesting. A generation ago, Rios’ sentiment would have been gospel. Eckersley and a few rogue pitchers aside, players generally had better control of their celebratory quirks. Today, with enforcers like Nolan Ryan—who would voice his displeasure through any number of fastballs thrown at an opponent who had just shown him up—increasingly rare, acts like Perez’s are common. It’s the game as we now know it. Seems like it’d behoove Alex Rios to come to grips with it. Instead of suggesting “it’d behoove Alex Rios to come to grips” I’d like to see the Junior League drop the desinated hitter, so they can learn the manly trait of humility. I bet we would see fewer pitchers making such outbursts. Today’s baseball players cross the line over celebrating. Even when a player makes an out, there is lots of high fives in the dogout. Amazing! The celebration at home plate of a last place team after a walk-off win looks like if they have just won the pennant or the last game of the World Series. Wow! Well, who can blame them? Today the field is covered with television cameras ready to record their antics and they know it. The old slap in the back is gone. But I have noticed lately those shenanigans are annoying not only the average fans but also a growing numbers of baseball players including their own team mates. What is going to happen in the future? I do not know. But lets go back to basics and try to teach the little leaguers the importance of winning without embarassing your opponent. I, too, fail to understand the recent phenomenon of piling on top of the guy who scores the winning run, even against a second-division opponent in May — never mind the possible repercussions, including Kendrys Morales and Aubrey Huff. If the goal is to teach Little Leaguers good sportsmanship, it may also be worth revisiting the fact that baseball is the only major sport in which the post-game handshake line involves only members of the winning team.